Harry Arter and others who could line out for the Boys in Green on Wednesday night. Harry Arter missed Euro 2016 due to injury. WITH JAMES MCCARTHY expected to be injured for next week’s World Cup qualifier, at least one of the midfield spots is likely to be up for grabs. 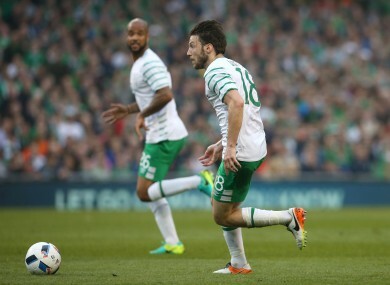 Harry Arter had been a strong contender for Ireland’s Euro 2016 squad before an injury scuppered his chances. Now that he’s back fit again, the 26-year-old — who has started all three of Bournemouth’s Premier League matches this season — should be given a chance to impress. Martin O’Neill should be well aware of what goalkeepers Darren Randolph and David Forde can do at this stage given their many appearances under the Irish manager. By contrast, while he has 18 caps for Ireland in total, Westwood has played just twice for Ireland during O’Neill’s reign, in the friendlies against Latvia and England. Consequently, Oman on Wednesday night seems the perfect opportunity to re-introduce the 31-year-old to international football. Despite being named in Martin O’Neill’s squad, Seamus Coleman is not expected to feature against Oman or Serbia. Therefore, Christie, who has been a regular for Derby in the Championship this season, will surely be needed over the coming days, having performed solidly as Ireland’s deputy right-back in the past. Along with Christie, David Meyler was the only outfield member of Ireland’s squad who didn’t see any game time at Euro 2016. However, Ireland could go into next week’s crucial Serbia clash with a somewhat depleted midfield, as both James McCarthy and Jeff Hendrick are struggling with injuries and may miss the World Cup qualifier. Meyler, though, has been excellent for Hull, playing every minute of Premier League action so far this season, as Mike Phelan’s side have defied the critics and unexpectedly won two games out of a possible three. The highly promising 21-year-old Bristol City winger caught the eye in Ireland’s pre-Euro 2016 qualifier against Belarus. Although it might be considered too big a risk to play O’Dowda in Serbia, the low-pressure game against Oman seems the ideal setting to give the Kidlington-born player his second cap. Email “5 players who deserve a chance to impress in the Ireland-Oman game”. Feedback on “5 players who deserve a chance to impress in the Ireland-Oman game”.